Clockwise from top left: Phlegmatic, Sanguine, Choleric, and Melancholic. There are many ways to make a group of people diverse without giving them overly specialized roles within an ensemble. One way is through matching personality types according to a wacky ancient pseudoscience. The Four Temperaments (also called the "four humors") was a theory that behavior was caused by concentrations of body fluids — the "humors" of classical medicine: blood, yellow bile, black bile, and phlegm. A temporary imbalance would create an illness: too much blood caused a fever, too much yellow bile caused a cough, too much black bile caused depression, and too much phlegm caused a cold. A permanent imbalance led to a person having a certain type of intentions, behavior, and personality. Though this has been a theory long-since discredited from a scientific standpoint, the general idea still remains and the theory is still used for personality profiling. An ensemble based on these four humors can make the cast diverse without actually changing the roles of the characters in the story. One of the interesting factors in the Four Temperaments, is that there is no Leader - any one of them could be The Leader in the piece and defines the approach the team takes to the problem, while in a series the focus can switch back and forth to develop characters separately - see A Day in the Limelight. Rather than meeting through coincidence or brought together in the first episode, these four are more likely to be long-term friends or family from the start. There may be a fifth person hanging around occasionally but they're not really part of the team; they just add flavour or play the part of The Mentor. Sanguine (blood): Extroverted, emotional, and people-oriented. Key Strengths: Charming, cheerful, loves people, energetic, talkative, passionate and compassionate, positive, sometimes unpredictable, expressive influencer, an excellent comedian, salesman or clown, quirky or eccentric and just plain fun. In common with phlegmatic: Friendly, forgiving, optimistic endurer, emotionally available, won't get negative, good with relationships. In common with choleric: Adventurous, confident, hard to embarrass. Key Weaknesses: Undisciplined, too talkative, emotionally unstable, hyperactive, scatterbrained, gullible, disorganized, late for work, and sometimes frivolous. Expressive high, responsive high; response's delay short, duration short. The Inspired Influencer of DISC and MyersBriggs types generally E_F_. Will often correspond with the Optimist or the Realist when in a Four-Philosophy Ensemble. Amongst the "Dere Types" can qualify as a pure Yandere or Deredere (Playful and Obsessive). Oni type and Good Cop/Bad Cop: Brash Red Oni with snark, but an overall diplomatic "Good Cop"
Corresponding element, season, and division of a day: (hot and moist) air, spring, and morning. In a person's life, it corresponds to young childhood (roughly ages 0-13). Archetypal color: Gold, brighter shades of yellow, all shades of pink or aqua (the colors of the Sky). The Yin-Yang Duo: Yang (white). Western Zodiac Signs: Gemini, Libra, Aquarius. Choleric (yellow bile): Extroverted, unemotional, and task-oriented. Key Strengths: Takes the lead, hard worker, strong-willed, practical, passionate, a good repossession worker, an excellent strongman/woman of the team (drill sergeant at the most extreme), determined, goal-oriented and thrives under criticism. Key Weaknesses: Hot-tempered, rude, rebellious, can be cruel, stubborn, harsh, bossy, expects complete devotion, insensitive, often condescending, can become psychotic in overbearing situations, workaholic, without compassion or conscience, can be a warmonger, vindictive, a shallow cynic of people's character, most likely a bad winner/loser, and may nastily misinterpret jokes. Expressive high, responsive low; response's delay short, duration long. 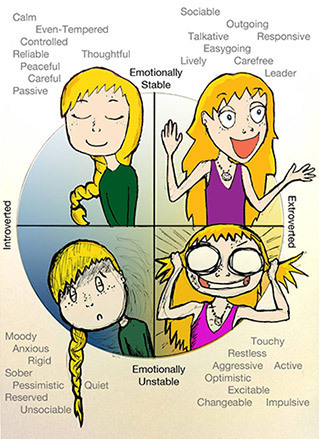 The Dominant Driver of DISC and MyersBriggs types generally E_T_. Will often correspond with The Cynic or the Apathetic when in a Four-Philosophy Ensemble. Amongst the four main "Dere Types" can qualify as a pure Tsundere (Harsh and Maturing). Oni type and Good Cop/Bad Cop: Red Oni and harsh, pure "Bad Cop"
Corresponding element, season, and division of a day: (hot and dry) fire, summer, and afternoon. In a person's life, it corresponds with adolescence and young adulthood (roughly ages 13-35). Archetypal color: Darker shades of yellow, all shades of red or orange (the colors of a Volcano). The Yin-Yang Duo: Yang (Red). Western Zodiac Signs: Aries, Leo, Sagittarius. Melancholic (black bile): Introverted, emotional, and task-oriented. Key Strengths: Detailed, conservative, analytical, organized, perfectionistic, faithful to a fault, discreet will of stone, elegant (in the more dignified ways), selfless, an excellent medic or lawyer. In common with choleric: Excellent leader, practical, an effective manipulator of people, punctual. Expressive low, responsive low; response's delay long, duration long. The Contemplating Conscience of DISC and MyersBriggs types generally I_T_. Will often correspond with The Cynic or the Realist Four-Philosophy Ensemble. Amongst the four main "Dere Types" can qualify as a pure Kuudere (Cold and Blunt). Corresponding element, season, and division of a day: (cool and dry) earth, autumn, and evening. In a person's life, it corresponds to middle-aged adulthood (roughly ages 35-65). Archetypal color: Navy blue, dark purple, olive or darker shades of green, all shades of brown or black (the colors of a cave or cavern). The Yin-Yang Duo: Yin (black). Western Zodiac Signs: Taurus, Virgo, Capricorn. Phlegmatic (phlegm): Introverted, unemotional, and people-oriented. note The temperament called Supine from another theory is covered in this temperament. Key Strengths: Calm, humble, an excellent assistant, spy or librarian, discreet, flexible will of steel (flexible steel), elegant (in the simpler ways), thoughtful, patient, modest, a real sweetheart, accommodating, steady-paced, sympathetic, perceptive, faith in morality (and leading by example), very compassionate, assuming innocent until proven guilty, a good listener, open-minded, considerate, and empathetic to all. In common with sanguine: Pleasant, forgiving, witty, easygoing, idealistic endurer, emotionally available, a good sense of humour, good with relationships. Key Weaknesses: Indifferent, submissive, lazy, slow, shy and passive, slacker, indecisive and too yielding. In common with melancholic: Timid and docile, scared of sudden change, stubborn (about certain things), easily embarrassed. In common with sanguine: teasing, too compromising, forgetful, unable to find what's wrong. Expressive low, responsive high; response's delay long, duration short. The Stable Supporter of DISC and MyersBriggs types generally I_F_. Will often correspond with the Optimist or the Apathetic when in a Four-Philosophy Ensemble. Amongst the four main "Dere Types" can qualify as a pure Dandere. Oni type and Good Cop/Bad Cop: Blue Oni and gentle, diplomatic "Good Cop"
Corresponding element, season, and division of a day: (cool and moist) water, winter, and deep night. In a person's life, it corresponds to older adulthood (roughly ages 65 and up). Archetypal color: Teal, green, white, gray, all shades of blue or black (the colors of the ocean). The Yin-Yang Duo: Yin (blue). Planet or Satellite: Venus and the Moon. Western Zodiac Signs: Cancer, Scorpio, Pisces. The four temperament system, while interesting, was seen as flawed even back then as some people did not fit with any of the presented humors, so a neutral temperament has been used, labeled sometimes as the Leukine, other times the Supine/Eclectic, although in fiction this has been mostly reserved either for the lead character or more commonly for secondary characters (as for Four-Philosophy Ensemble, usually the Realist or Apathetic). A fifth temperament was originally derived in modern temperament theory from the once popular FIRO-B psychometric instrument, which included moderate scales. When the temperaments were mapped to it, the traditional Phlegmatic ended up moderate in both "expressive" (classic "extrovert" and "introvert") and "responsive" (classic "people vs task" focus) scales, and the low expressive high responsive area was labeled "Supine". In some versions of the theory, this is reversed, with the Phlegmatic kept in its old place, and the new temperament considered the moderate one. This "fifth humour" often shares many common elements with the Phlegmatic. The difference is that the Phlegmatic is this way from a lower energy reserve which leads him to take the path of least resistance (to either go with the flow and be agreeable, or to be stubborn and slow), while the Supine has an emotional energy that drives him to be reserved, but wanting of acceptance from others. Historically in plays, there was a whole genre: Comedy of Humors, where the impetus of the story is the sudden banding of these opposing types. This is in contrast to the Comedy of Errors, where the story is driven by the events and situations. They are similar to the four Personality Blood Types, and are sometimes also a Four-Element Ensemble. See also Cast Calculus for the overarching archetypes in this and differently numbered ensembles. Here is an Image Archive for this trope. Additionally, Pseudolonewolf (of MARDEK fame) has a page that goes into great detail on the four temperaments, here (older version with blends here ), Eric B has a page that explains the five temperaments here, and The Other Wiki offers its information here. For another way to split up a group of four, see Four-Philosophy Ensemble. Sab Jholmaal Hai: Bunny (Sanguine), Popat (Choleric), Zordaar (Melancholic), and Honey (Phlegmatic). The four main anthropomorphic animal characters in the Sonic X fanfic Don't Keep Your Distance. Paint (Sanguine), Maxwell (Choleric), Jewel (Melancholic), and Arrowhead (Phlegmatic) seem almost designed after the four classical temperaments at times. Barack and the White House Boiz, consisting of Barack Obama (Melancholic), Joe Biden (Sanguine), Bill Clinton (Phlegmatic), and Mitt Romney (Choleric) in the RPF Ice Ice Baby. Barack is cautious and thoughtful, and refuses to be divisive. Joe is the happy-go-lucky, loudmouth of the bunch, Bill is humble in his talents, quiet and always willing to lend a helping hand. Mitt stays plotting, and only wants what's best for him. The four boiz work together to stop the assassination of Queen Elizabeth II. Sanguine: Phaeton, fun loving, and somewhat dumb and perverted. Choleric: Icarus, an extrovert who has trouble making friends, and is quite Hot-Blooded as a result. Melancholic: Erika, The Stoic, and the most serious of the group. Phlegmatic: Frey, who tries to stay cool headed in the face of danger. Leukine: Mikael, the mediator, who tries to ensure that none of the above kill each other. It's worth noting that while Frey is generally Phlegmatic, Icarus' Troll tendencies can push her into Choleric territory. Also, despite Frey being Phlegmatic, she is the Red Oni to the Choleric Icarus' blue. Sanguine: Freya. She is largely a Genki Girl and The Heart of the group. Also The Gadfly, and it takes a lot to get her mad. Choleric: Azazel. The poster boy for Jerkassery and is very Hot-Blooded. Though, due to being a Crouching Moron, Hidden Badass, he falls into Sanguine quite often. Melancholic: Uriel. The Emotionless Girl, and the Only Sane Woman. Often clashes with Azazel. Phlegmatic: Azrael. Nice Guy (until he starts taking levels in prickery, and even that only lasts until Chapter 7) and Deadpan Snarker supreme. Also tries to be The Heart (emphasis on 'tries'). Eclectic: Forseti. Tends not to participate in group dynamics, but when he does, he is levelheaded and calm enough to stay out of Sanguine and Choleric, but not enough to enter Phlegmatic and Melancholic. The Spectrum Game: The first 4 characters to join the Inspectors have this dynamic with each other. Sanguine: Silas, the energetic Nice Guy. Not too bright, but somewhat Hot-Blooded. Incredibly benevolent, and a patient foil to Inigo. Choleric: Scarlett, the low-key Tsundere. The Only Sane Woman of the group, and the others tend to get on her nerves, releasing her anger issues. Melancholic: Inigo, the brutally honest stoic. The most intellectual and snarky of the ensemble. Borders on Sociopathic Hero at times, and may be mildly depressed. Phlegmatic: Azurine, the gentle Nice Girl. Treats everyone with kindness and is the most optimistic member of the group, as well as the one putting the most emphasis on the 'Iron' part of Iron Woobie. Sanguine: Bayley: a vice cop with the LVPD. One of the few good cops in a department full of corruption, very easygoing unless crossed, geeky. Choleric: Becky Lynch: a foot soldier for the Vegas Irish mafia. Tends to shoot first and ask questions later, likes being in charge but doesn't have the patience or long-term planning stratagem to be the boss. Melancholic: Charlotte Flair: head of the Flair crime family. Cold-hearted, cerebral, keeps her emotions hidden when dealing with her contemporaries. Phlegmatic: Sasha Banks: an emergency room nurse. Professional, good and nice with her patients, wants to help everyone, loyal to her friends. Juxtapose has Izuku and his friends in the General Education department forming this kind of ensemble. Sanguine: Izuku is easy-going, friendly, and optimistic (if awkward). He's by far the most charming and magnetic person in the group who holds the others together. Choleric: Kensei is excitable and twitchy. He's almost always enthusiastic about everything, whether it's building gadgets or breaking into a room he wants to get into. Melancholic: Hitoshi is aloof and sarcastic with a biting wit. He often messes with his friends to get a rise out of them and is the most coldly pragmatic of the bunch. Phlegmatic: Megumi is quiet and a voice of reason in the group. Her Touch Telepathy Quirk makes her The Empath who keeps tabs on everyone to keep their emotions from running over. Earth group is Sanguine (self-centered, objective orientated); includes the Tiger, Wolf, Monkey, and Koala. Sun group is Choleric (self-centered, situation orientated); includes the Pegasus, Elephant, Lion, and Cheetah. Full Moon group is Melancholic (mindful of others, objective orientated); includes the Sheep and Panther. New Moon group is Phlegmatic (mindful of others, situation orientated); includes the Fawn and Tanuki. In Warhammer and Warhammer 40,000, appropriately enough, the four gods of Chaos each represent an emotion and mindset. Khorne the god of anger and bloodshed is choleric. Slaanesh god of passion and lust is sanguine. Tzeentch god of ambition and hope is (ironically) melancholic. Nurgle god of despair and disease is phlegmatic. This is an explicit game mechanic in Promethean: The Created, where four out of the five main player Splats is full of a specific humour that affects their personality and powers (with the fifth, Ulgan, being filled with the "ectoplasmic" humor of spirits). There are even mechanical benefits to travelling with a full Four-Temperament Ensemble. The five praetors of Magic: The Gathering: Elesh Norn is choleric, Jin-Gitaxias is melancholic, Sheoldred is phlegmatic, Urabrask is sanguine and Vorinclex is eclectic.